For most of us, vacation time often seems too short. You work hard and deserve to make the most of your free time. We know the benefits of vacationing — time off from everyday routines, the daily grind — we understand the importance of rejuvenation and embrace the productivity we bring to our home and working life after taking time off. So, when you book your next getaway from the everyday, why not make it extraordinary? 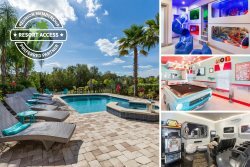 That means places where you can swim in the brightest sunshine, golf to your heart's content and experience a caliber of fun on par with the unique theme parks of Central Florida. All while knowing that after a long and exhilarating day, you will spend your nights in the lap of luxury. Luxuriate in surroundings so gorgeous that you find yourself taking more pictures of the house than you did at the beach. Stay at a home where it's completely natural to feel a sudden rush of joy — one that you will recall when a look of envy flashes across the faces of friends as they swipe through your photographs of your luxury vacation home. Go ahead and boast about the upscale furnishings and high thread counts of the sumptuous bedding. And no one will blink an eye when you casually refer to your luxury digs as your "summer home." Devour the latest bestseller in an oversized chaise lounge. Stretch out beside a sparkling pool after a refreshing dip. Soak away all your cares in an intimate spillover spa. Prepare meals with your family in a chef's dream kitchen and serve it up in front of a picture window that features endless views of a stunning nature preserve. Sip up-to-the-minute craft cocktails from your private balcony overlooking the pristine 4th hole. There are so many leisurely and luxury activities to do at your villa, that you may have to make plans to enjoy them all. This is your time to savor every moment. There's high-end luxury and then there's over-the-top lux. Imagine the reactions you'll get when you tell your family their vacation home this year comes equipped with a 9-seat stadium seating theater room with projection screen, Xbox and surround sound. Or an arcade with a multi-game arcade system, an air hockey table and PlayStation 4. This is where the phrase "go big or go home" is most definitely appropriate. You may even save a small fortune when the kids decide they'd rather stay at home and play than visit local attractions and theme parks. And speaking of themes, how about kids' bedrooms decked out in beloved cartoon characters, popular video games or a personal space dedicated to LEGO bricks just waiting for your little wannabe architects to build their own dream world. Whether you desire a 3 bedroom/3 bathroom luxury condo or a 9 bedroom/9 bathroom custom estate home, it seems that no dream is too big. This is your vacation. Live large and create memories that will last a lifetime.